Parent-teacher conferences are not just for parents who have concerns about their child in the classroom. These meetings provide an opportunity for parents to partner with teachers in providing a good learning experience for children. 1. Prepare for the conference. Keep a folder with tests, papers, or any other topics you want to address. Do your research by talking to your child; find out how she is doing in class, what’s happening at lunch and recess. 2. Respect the teacher’s time. Be prompt, try not to bring other children and do not answer your cell phone during the meeting! 3. Begin with a positive attitude. Start with a compliment for the teacher before addressing concerns. Starting with a negative comment could put the teacher on the defensive. 4. Work together. Purpose to partner with your teacher by being a team player. Approach issues the teacher raises with the attitude of "We have to work together on this problem." 5. Remember that this is about your child, not you. The teacher is not trying to tell you how to parent. He is only there to help your child. No need to get defensive. 6. Listen and be open minded. A conference is for teachers to give parents information based on classroom observation. The teacher would not bring up an issue if it was not necessary. 7. Teachers are not the enemy. If you have a problem, no need to go on the attack. They care about your child and want to help you and your child resolve the issue. 8. Ask questions. After you’ve listened, it’s your turn to ask questions. Make a list beforehand so you’ll remember what’s important. 9. Learn the communication protocol. Ask the teacher her preferred method of communication: phone, email, or notes. Let the teacher know you want to be an available parent. 10. Ask how you can be involved. Whether you work full-time, part-time or not at all, involvement is about being aware of what's happening with your child's education, not just about volunteering in the classroom. What can you do at home to support what your child is learning at school? How can you help the teacher in planning for events? Can you help organize a class party? SignUpGenius provides you with tools to make the job easy. 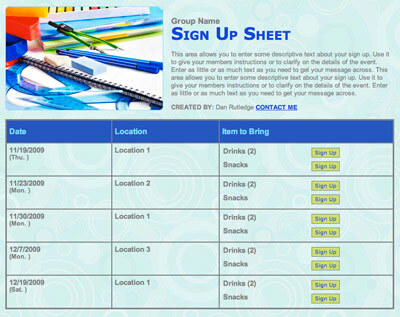 See the many ways SignUpGenius can be used in school and get started HERE! 11. Let the teacher teach. If you have an idea about how to solve a problem, try asking instead of telling. Do you think Jaden would listen better if she wasn’t sitting next to her best friend? 12. Keep the teacher informed. Teachers appreciate knowing what's going on with your child. It's important to communicate medical or family issues in your child's life. 13. Stay on topic. Again, the conference is about your child, not you. Resist the urge to talk about your own upbringing, problems or experiences. Save those casual conversations for another time. 14. Take Notes. They will help you remember the good points and areas for concern. It’s good to have notes to look back on so you can target the areas that may need improvement. 15. Follow up. Don't be afraid to ask for a parent-teacher conference at any time during the year if you need or desire additional information. 16. Do your part. If the teacher discusses something with you that you need to talk to your child about, be sure you do your part. That’s how a partnership works! 17. Talk to your child about the conference. First, share the positive comments her teacher said, then talk about concerns you discussed. Explain how you can all work together to be sure that your child has a successful year. 18. Stay in touch. Don’t let the conference be the only time you communicate with your child’s teacher. Make a point of touching base with her throughout the year, just to let her know how your child is doing at home and that you are still partnering with her. 19. Be an encourager. Teaching is a very hard job and often teachers only hear from parents when something is wrong. Be sure you let your teacher know when they do something right! 20. Remember the goal. The objective is to leave the conference knowing that you have forged a partnership with your child’s teacher that will help your child have a great school year. By staying involved and making your efforts known, you will be well on your way to a successful and happy school year. Make it a great one for you and your child! Hi Diana. Sorry you're having troubles. 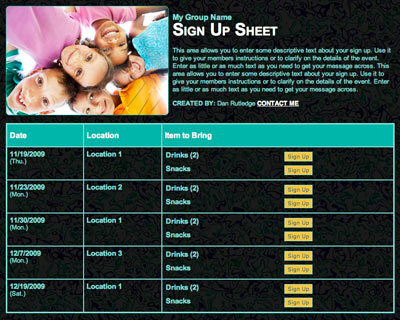 We have a great time slot system that should make setting up your conferences a snap! If you're having troubles, contact us via the help tab at the top of this page and we're happy to assist! Help plan the classroom holiday party with ease!